Healing ministry celebrates 25 years With Mass, music, confession and prayer, the Arlington Healing Ministry helps mend physical, emotional and spiritual wounds. Fr. Horace (“Tuck”) Grinnell, pastor of St. Peter Church in Washington, Va., prays over a woman during a healing service at St. Anthony of Padua Church in Falls Church Oct. 15. The service marked the 25th anniversary of the Arlington Healing Ministry and included Mass and opportunities for confession. It was well past Isaac’s bedtime, but he was alert and calm as Deacon Leo Flynn knelt down near the altar to pray over the 5-year-old and his mother, Sarah, who brushed away tears. Isaac has an autoimmune illness contracted from a bad reaction to medication he received at 2 months old. He also has chronic Lyme disease, likely the result of his poorly functioning immune system. On the other side of St. Anthony of Padua Church in Falls Church, Juan Vitali stood, head bowed, as two prayer ministers rested their hands on his shoulders and prayed quietly. Vitali has Crohn’s disease, an inflammatory condition of the gastrointestinal tract. The parishioner of Good Shepherd Church in Alexandria will undergo his 31st surgery next month. Sarah and Isaac (names have been changed for privacy) and Vitali were among the nearly 150 people — some with physical ailments, others with psychological or spiritual burdens — who attended an Oct. 15 healing service. The evening service marked the 25th anniversary of the Arlington Healing Ministry and included Mass, opportunities to be prayed over and receive the sacrament of reconciliation, and a post-Mass celebratory cake. “It was a beautiful night of healing, and you could just feel the Holy Spirit,” said Catherine Griffin, ministry founder and administrator and a parishioner of St. John the Evangelist Church in Warrenton. When Griffin’s husband was dying from cancer, there were no local healing services, so she made the trek back and forth to Baltimore for Masses. Just two months after his death in 1990, Griffin began building a healing ministry in her home diocese with the help of Missionhurst Father Arthur Verstraete and Deacons Harold Brodeur and Robert Curtin. Because Father Verstraete was not in good health, Father Horace (“Tuck”) Grinnell, then in his first stint as pastor of St. Charles Borromeo Church in Arlington and now pastor of St. Peter Church in Washington, Va., was asked to take the lead. “We knew we needed a way to pray for one another besides the sacrament of the sick; we needed to use the gifts that God has given us in the Eucharist and in the sacrament of penance,” said Father Grinnell during his homily at the anniversary Mass. Father Grinnell celebrated the Mass with concelebrants Father David L. Martin, pastor of St. Luke Church in McLean, and Father John H. Melmer, parochial vicar of Our Lady of Lourdes Church in Arlington. Deacon Flynn of the Washington Archdiocese assisted. All three priests, along with Father Jeb S. Donelan, parochial vicar of St. Anthony, take turns celebrating the monthly Masses at parishes throughout the diocese. The Oct. 15 service was a chance to “celebrate this milestone, to remember and to renew what God has given us — that is, the power and the desire to pray for one another,” said Father Grinnell in the homily. He emphasized that healing comes not from the person praying over the sick but from God, that God longs to heal us, and that the one assured way to achieve peace is by relinquishing sins through confession. “When you go home tonight, when you feel that peace beyond understanding, … know that it comes from God in heaven,” he said. Moments of joy and tears took place throughout the church after Mass, as people filed into lines to be prayed over by the priests, deacon and prayer ministers. In the background was the music of the New Spirit Singers, the ministry’s choir. There are about 16 prayer ministers in the ministry, and each goes through a training process. “Prayer ministers are people who have been very active in the church, people with great faith,” said Griffin. New ministers are teamed up with seasoned ones, so they can witness different praying styles. All take their cues from what the sick person asks for and tailor their prayers to that individual. “The common denominator (for all ministers) is that they are willing, that they believe in prayer, that they are good listeners and that they are open to the Holy Spirit,” said Father Grinnell. He acknowledged some might be wary of a healing ministry, but said the image of someone “slapping you on the forehead and you falling back healed” is inaccurate. “This is communal prayer over the person, and it is always private and confidential,” he said. At the end of their prayers, ministers anoint the sick person, or the ill person’s proxy, with blessed olive oil (not the oil of the infirm, which is blessed by the bishop and used sacramentally). Although not publicized, many healings have been attributed to the ministry. Two individuals said it helped cure their cancer. The cures people seek don’t always happen, but sometimes individuals are healed of deep wounds they didn’t even know they had, said Father Grinnell. The next Arlington Healing Ministry service is Nov. 19 at St. John Neumann Church, 11900 Lawyers Road, Reston, at 7:30 p.m. The New Spirit Singers bring a beautiful new dimension to Arlington’s healing ministry. When Father Horace (“Tuck”) Grinnell celebrates the Arlington Diocese’s healing Mass at a different parish each month, the New Spirit Singers (NSS) are there beside him to provide music of comfort, hope and reconciliation — a healing ministry joined nearly three years ago by the choir that first came together in 1972 at Holy Spirit Parish in Annandale. “One of the greatest blessings of the Arlington Healing Ministry is the participation of the New Spirit Singers at the Masses,” said Father Grinnell, pastor of St. Anthony of Padua Church in Falls Church, who has led the ministry for 20 years. “When I am praying with people for healing, I find the songs the choir is singing become part of my prayer and part of the healing. Many people have told me that they have experienced healing through the music at the Mass and during the healing prayer itself. Some choir members have been with the group almost from its beginning, while other members joined recently. The NSS participated in a weekly parish Mass for 34 years, and the choir enthusiastically accepted Catherine Griffin’s invitation to provide music for the monthly healing Masses. The new ministry is a good fit for the choir, whose members say that the healing is not just for the congregations but also for those in the music ministry. Sometimes their problems and old resentments seem to disappear and they feel healed by the end of the service. They are gratified when their music touches someone in a specific way, as when a woman admitted that one of the songs made her stop focusing on her troubles and instead reflect on all the good she had in her life. Traveling to a different parish each month — from Culpeper to Arlington to Leesburg and everywhere in between — coping with varying sound systems and choir spaces, and hauling amplifiers and equipment requires flexibility and commitment. But it brings special rewards. Outside of Mass, the choir welcomes new members, hopes to play a parish Christmas Mass again someday, and works hard during the weekly rehearsals to add music and keep the repertoire fresh. The 22 choir members say the uplifting, scripturally based music has more meaning and relevance for them than most organ-based, traditional hymns. Choir members value the sense of belonging, support and warmth from each other. They believe they matter to the congregations. And most significantly, they find deep satisfaction in the sense of helping others in the parishes where they minister. Greenley is a freelance writer from Northern Virginia. Healing ministry administrator Catherine Griffin knows a thing or two about the power of prayer. When her husband was diagnosed with a rare and invasive form of lung cancer in 1989, Griffin and her family prayed for his recovery. After he died, she didn’t know how she was going to carry on. Now she realizes that God did answer her prayers, but in a way she never expected. After attending what was to be the last Mass she and her husband would ever celebrate together at St. Anthony of Padua Parish in Falls Church — where they had been parishioners for 30 years — she was handed a card with information about the Catholic Healing Ministry of Baltimore. Griffin called the number on the card and made arrangements to attend the next healing Mass. When her husband’s condition worsened, she sent her son to pray for him instead. Griffin’s husband passed away two days later. Because her son had told her how beautiful the healing Mass had been, Griffin made a point to attend the next service. There, she was impressed with how warmly she was welcomed and with the encouragement she received. “The person that prayed with me was a nun and she said, ‘Your husband can do more for you and help you more where he is than if he were here on Earth. Don’t ever forget that just because he’s in a different life, he isn’t gone,’” she said. She was so moved by the service that she made the trip to Baltimore several more times to attend the Masses. She began to wonder why there wasn’t a healing ministry in the Arlington Diocese, so she talked to her pastor, Msgr. Thomas Cassidy, and asked him if she could plan a healing Mass at her parish. The first Mass at St. Anthony drew a large crowd and Griffin was inspired to take her case to then Arlington Bishop John R. Keating to ask if she could start a ministry. Bishop Keating loved the idea and encouraged her to go ahead with her plans. Even after receiving the bishop’s approval, though, Griffin still needed help. She needed a priest to be the moderator. Father Tuck Grinell, now pastor of St. Anthony, agreed and he has been the priest in charge of the ministry ever since. Over time, the ministry has grown. Now there are about 20 prayer ministers, a ministry choir, several priests who hear confessions, as well as many volunteers. Everyone works together on the same mission. She describes the services as beautiful and very traditional — not the theatrical brand of spiritual healing you might see on television. The healing service consists of a Mass, a special service where prayer ministers pray with attendees, and time for sacramental confession. The Mass takes place at a different parish 11 months out of the year. Through the years, Griffin has seen many different kinds of problems and many different kinds of healings. As administrator, Griffin is in charge of the ministry’s behind the scenes work. She plans the services, arranges for the priests to celebrate Mass and hear confessions, arranges for the choir and chooses the music. It’s a lot of work, but the rewards have been great. In her work with other people, Griffin has also found the healing she needed after her husband’s death. “It’s been a blessing and that was my healing,” Griffin said. “I was praying for my husband to be healed, obviously, and when he wasn’t healed, well, that’s what that means when they say, the Lord doesn’t always answer our prayers the way we’re asking." A sidebar article, “Physician reminded that ‘nothing is impossible with God’ after healing,” describes the inspiring story of Dr. Rex Ruiz and his experience of the healing ministry in at Our Lady of Good Counsel Church in Vienna, VA. The article also describes the beginnings of the healing ministry in Arlington diocese and Father Grinnell’s role in it. For more information about the healing ministry in the Arlington diocese, visit their web site http://healingministry.net/. The next Mass and healing service will be on Thursday, September 18th at Saint John the Apostle Catholic Church in Leesburg, VA at 7:30 pm. The 18th Anniversary Mass and healing service will be on Friday, October 17th here at Saint Anthony of Padua at 7:30 pm. As Father Grinnell describes, the Mass and healing service is a wonderful spiritual and healing experience; if you know someone who is ill but cannot attend the Mass and service, you can also attend in their place to pray for them or have them prayed for. If you would like to read the full articles in the OSV newspaper, please come by the parish office (open 9am to 9pm Monday through Friday). For information about Our Sunday Visitor visit their web site http://www.osv.com/. http://www.catholicherald.com/detail.html?sub_id=5297 This is from 1999, some information will be out of date. An image of Jesus resurrected, arms outstretched, welcomed people coming to seek solace last Thursday evening at St. Timothy Church in Chantilly. Facing the main parking lot, the breathtaking, softly lit stained glass window seemed a beacon of hope to those attending the monthly diocesan Mass and healing service. Inside the church, an estimated 300 people were gathering. As Father Tuck Grinnell prepared to celebrate the traditional Mass, a delicate piano piece was being played, part of the music ministry directed by Mark Forrest. Catholic Healing Ministries moderator since its founding in 1990, Father Grinnell is pastor of St. Anthony Parish in Falls Church. Individuals attend the Mass and healing service for many reasons, said Catherine Griffin, the ministry’s administrator and member of St. Anthony Parish. She began the ministry after her husband died more than 10 years ago. Addressing the burdens the congregants had brought with them, Father Grinnell spoke of when one "feels filled with fear that you’re not able to dispel … How can we act when we feel that God is far from us?" Referring to the reading which explains that "perfect love drives out fear" (1 Jn 4:18), he said "we can choose to act out of love." When we do so, "we can be sure that God is dwelling in us." Father Grinnell asked the congregation to pray for those around them and encouraged everyone to partake of the sacraments of Eucharist and reconciliation, he. It was clearly an emotional evening for some, as people presented their petitions during the healing service after Mass. Some were asking for healing for themselves, and others had come to stand in for another. Two-person lay teams prayed with individuals requesting healing, who also received a laying on of hands and anointing with blessed oil. Father Grinnell pointed out that this was not the sacrament of anointing of the sick, which may be administered only by a priest for physical healing, but a Catholic community praying together. Griffin said that the healing Mass does not carry the "charismatic" label. As beautiful, meditative music resounded through the church, long lines formed in front of the many prayer teams and near the confessionals. The diocesan ministry’s goal is "helping people be healed, reconciled and nourished spiritually in union with Christ … (where) … "we celebrate the healing power of Christ through the celebration of the Eucharist. "Our ministry is made up of the clergy and laity, united to take seriously the call of Jesus to heal the whole person spiritually, emotionally and physically. We ourselves are not ‘healers’ but rather hope to be the instruments of the healing power of Christ." Attendance at the services ranges from 200-600 individuals, some attending each month. The dedicated 15-20 lay volunteer prayer ministers from various parishes are specially trained for their work. The Arlington Catholic Healing Ministries is modeled on the one in Baltimore, founded by Father Larry Gesy. 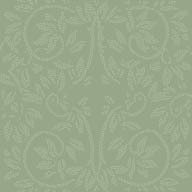 He has written a book on the ministry, The Hem of His Garment: True Stories of Healing, published in 1996. The first time Griffin spoke to the priest in June 1989, she said that his "kindness and compassion … I would discover, was a large part of the healing ministry." Griffin’s husband, Alfred, had been diagnosed with a terminal illness five months earlier and had many people praying for his healing. Just two days before his death, the couple’s son, Chris, and wife, Lori, attended one of the Baltimore services to pray by proxy for their father’s healing, and were "overwhelmed by its beauty." After Alfred’s death, Catherine said, "We often hear it said that God always answers our prayers, but sometimes not in the way that we expect. It is now clear to me that the healing that I had requested for my husband was ultimately given to me, and that God was really listening to my prayers." She wanted to begin a similar healing ministry in the Arlington Diocese, and through her efforts and the "gracious consent" of Msgr. Thomas Cassidy, then pastor of St. Anthony Parish, Father Gesy and the Catholic Healing Ministry of Baltimore came to the parish for a Mass and healing service attended by 1,100 people in the fall of 1989. In October 1990, after approval by Bishop John R. Keating, the Catholic Healing Ministries of Arlington held their first Mass and healing service at St. Anthony Parish. The Mass and healing service is now held monthly at parishes throughout the diocese. Forrest, an international Irish tenor and member of St. Elizabeth Ann Seton Parish in Lake Ridge, has served as the music director of the ministry since the beginning. At the Jan. 6 Mass and healing service, he performed with Bob Downey, organist and pianist, who has been devoted to the ministry for three-and-a-half years; Downey’s wife, Therese, vocalist; and Tina Pivarnik, guest vocalist. "I get more out of it than I give," said Forrest of his 10-year involvement in the ministry. He committed to it because "I very much see the need for it," he said. "It is amazing to see and hear the pains that people bring to the healing service." Forrest said "good music allows people to meditate a lot more. It opens up the spirit." Describing the service "centered around the Eucharist" as a "gentle, welcoming" atmosphere," Forrest said it is an occasion "where people can open up their heart and get Christ back in their life." He said it also is "wonderful to see the amount of young people" that are attending. "Sometimes," he said, "I don’t feel like going because I’m busy, or feel it’s too far, or whatever, but when I do those are the times when God shows me I needed to be there." 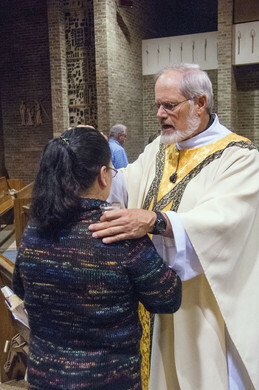 Father Grinnell said that even before his ordination more than 25 years ago, he participated in prayers for healing through the Charismatic Renewal. In the diocesan healing ministry, he said "major healings come through the Eucharist and the sacrament of penance." He has seen "healings on a number of levels," he said. "Some are physical," some may be "a spiritual healing. People speak of a feeling of being cared for by God, having a deeper faith, consolation and a sense of peace even in the midst of their difficulty." Father Grinnell said some of the many circumstances he has known people to being people to the services are an alleviation of "anger, anxiety, depression or job loss." The healing he has witnessed is not always instantaneous, Father Grinnell said. "God works in His own time," he said. "One relies totally on God. "The next Mass and healing service will be held on Feb. 10 at Blessed Sacrament Church, 1427 W. Braddock Rd., Alexandria, at 7:30 p.m. For information on the diocesan Catholic Healing Ministries, call Catherine Griffin, administrator, at 703/379-1450. Copyright 2000 Arlington Catholic Herald, Inc. All rights reserved.